Mug Design by: Terri Zaelit. If you have fun with the other Mug Characters you will love this one. 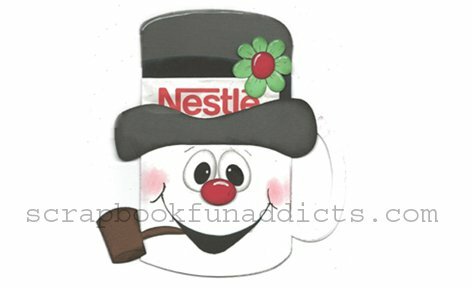 Frosty is great to hold Hot Chocolate packages, Gift Certificates or whatever you want. We used White gel pen(Uni-ball) for highlights and thin Black gel pen(Pentel .05) for outlining. Colorbox Blackbird and Dark Green, you can use Prima ink if you desire we used dry chalks for the cheeks.